2017 has been quite a year. It’s been full of many great experiences–getting our oldest started in kindergarten, publishing Shattering the Perfect Teacher Myth with Dave Burgess Consulting (and doing some speaking to share that message), and serving in a new role in my school district. But 2017 has been tough, too. It’s included far too much loss. Too many inexplicable situations of loss. I’m ready for a fresh start a new year can bring. With the new year, I’m excited to reset my habit of blogging. Throughout the fall, I made the mistake of not continuing to process my learning and share my learning through this blog. So, on the cusp of the new year, I find myself reviewing the past year of blogging to remind myself of how much I grow when I blog. 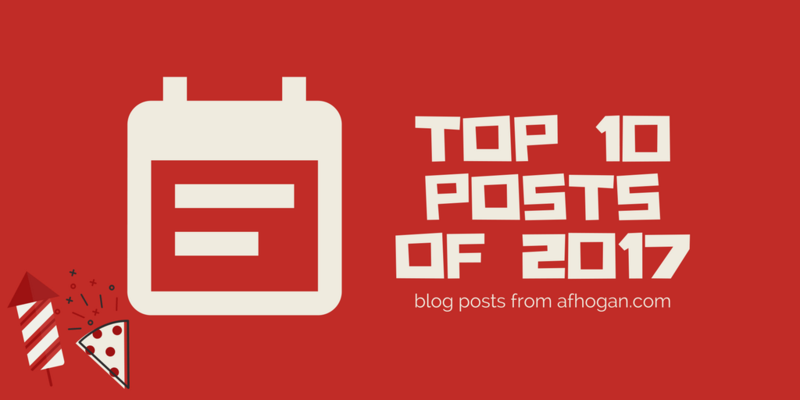 Looking forward to a new year of blogging, here are the top 10 posts from the past year. 10. What is Your Watch? This post is not about watches. It’s about those things that look right, but are actually in need of some attention in our work. Without looking closely at our practices to see what is working and what isn’t, we’ll never even notice that something needs to change. This post is actually a guest post by Marina Rodriguez (@mrodz308). She runs an amazing hour of blog club after school with her 4th graders, and after visiting the club during the spring, I couldn’t pass up the opportunity to have her share some of her experience. Not surprisingly, she went above and beyond and shared responses from her students about their experiences as bloggers. Don’t miss this post! I’m not good a resting. I’m just not. If I don’t make a plan to take a purposeful break, I won’t use the time wisely and won’t get the rest I need. This post was one of those “Write it like it’s for others, but know the message is really for yourself” posts. It’s certainly applicable at more times than summer, too. Innovation is easy to talk about and tough to actually realize. Even when we get started, it’s really easy to stall out after the enthusiasm of doing something new wears off. This post highlights a few pitfalls to avoid as you tackle that innovative opportunity. I’ve always felt the tension between the personalized learning we ask teachers to provide and the often one size fits all PD that we provide teachers. Creating personalized PD seems impossible (or at least impossibly time consuming), right? This post shares how we created PD for our teachers that relied on their experience and expertise; it offered a personalized touch to our PD for the year and was a huge hit with teachers. The best part is that it’s doable for so many to pull off. I don’t do many how to posts, but this definitely fits that bill. Twitter Moments began as something only for big time national news and epic social media fails, but when they released the feature to all users, I saw an opportunity to use this for educators. The post highlights how to create a Moment on Twitter and why that might be useful. Enjoy! We hear so much about starting the year well, but there’s comparatively little out there about ending the year well. I set a quick tweet out about how folks end the year purposefully, and I was overwhelmed with the response. This post is a result of the great ideas of the incredible educators who fit my request into their busy schedule in May. I love it! There’s a lot of conversation about change in education today, but it’s easy to stay right there–at the conversation level–and never actually put any change out there. I offer four questions to help actually create change in this post. They’re certainly not magic, but they’re necessary parts of the process if we want to actually see shifts happen. I really like this post. A lot of times, it feels like we have to do something amazing to make an impact, but the reality is that our little day to day actions have an incredible impact on others. I like that this gets shared from time to time because it reminds me to stop overthinking and remember the little things are big things in the end. My most read post for the year was just what is sounds like–a big post of 41 books that I feel are worth reading. Everything there isn’t likely for everyone, but there should be something for almost everyone on the list. Just going through this makes me excited for the new year. 2018 has plenty on the horizon for me, and I hope the same is true for you. I’ll be back with plenty of new blog posts to process through all that the year will bring.